Indian cooking does not need a lot of fancy equipment. A few good essentials will make cooking fun and easy. Traditionally a lot of cooking was and is still done in brass pots lined with aluminum or even thick stainless steel pots. With the advent of non-stick cooking equipment, the Indian kitchen has experienced a shift in tradition. Many Indian households have modern cooking equipment which is not only easy to cook in, but even to clean. Here is some of the basic kitchen equipment that you might need to get started. Masala Dabba ( Spice Box) : Almost every Indian household will have a spice box. A fixture in Indian kitchens, this one is a "must have"
The Indian cook will then fill these compartments with his/ her seven favorite regularly used spices. We like to recommend to put the following in your masala dabba. Red chili powder, Turmeric, Garam masala, Cumin powder, Cumin seeds , Black mustard seeds and Asafoetida. You can personalize your masala dabba. Cooking will become a breeze and you will not have to look for the spices, which get lost in the cabinets sometimes !!!!!. 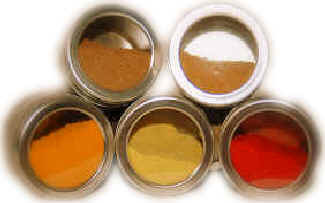 Red Chili powder, Turmeric powder , Cumin Powder, Coriander Powder & Garam Masala. LABELED, SEALED ! Shop BAZAAR! BAZAAR! for Hot Sizzling Indian Gifts ! Tava : Traditionally an iron griddle is used for making Indian breads and shallow frying. Kadhai : A traditional Indian iron wok. It is much deeper and narrower than Chinese wok. Used mainly for frying. Being versatile is used for cooking. In fact, "kadhai cooking" has become very popular in recent years. In authentic kadhai style cooking, the ingredients are cooked together in a thick, tomato-based sauce and seasoned with a savory garlic-ginger mixture. Almost all of the curries can be made in a well seasoned kadhai. A good size is about 13" wide and 3 inches deep. Again we would recommend using a thick aluminum non stick wok. This will ensure the reduction in the amount of oil or fat during cooking. Indian cooking sometimes requires browning of the onions and if the kadhai does not have a non stick surface then one needs to add more oil / fat during the cooking process. Investing in a good wok will make life in the kitchen easier. A good blender is an essential for making the smoothest masalas or chutneys without adding a lot of water. Chakla-Belan (Rolling board & Rolling pin) Belan : Rolling pin. Chaklas are round flat platforms made of marble or wood on which the dough for chapattis are rolled with the help of the belan, or the rolling pin. Chimta *: Tong. Chimta (Flat Tongs)This is an unique Indian flat tong-like invention used to roast rotis or papads on an open flame. Degchi i: Cooking pot made traditionally out of brass or copper. Nowadays, copper bottomed stainless steel pots and thick aluminum pots are also widely used. The neck or opening is narrower than the base. They are very versatile in the kitchen. Also known as pateela, handi, deg, these were traditionally made of copper or brass. Nowadays in most modern Indian kitchens, non-stick varieties are commonplace. So are aluminum and stainless steel ones. A pateela looks like a saucepan without a handle. The handi and deg are thick, rounded-bottom vessels where the neck, or opening is smaller than the base. Both are used to cook vegetables, thicker gravies and rice. Handi The cooking is done in a thick bottom pan so that the food does not stick or burn; the lid helps retain the aroma and flavor. Both "bhunao" and "dum" are aspects of Handi cooking. Pakkad (Tongs) Traditionally, Indian utensils did not have handles and were lifted onto and off the fire with a pair of tongs. Parat: A steel/brass/aluminum plate with a high edge in which dough is kneaded. Tandoor (Clay oven) A traditional clay oven used to barbecue meats, and cook breads like naans. It is believed the charcoal fire that gives the food its smoky flavor cannot be replicated in modern ovens, but most recipes can be suitably adapted to the modern electric/gas ovens. Tandoor: Cylindrical clay oven. Found mostly in restaurant kitchens. Is very versatile and can be used as an oven and a grill. The flavor that it imparts to the food from the hot charcoal is very delicate and delicious. The Indian Tandoor is a clay oven in which meats are barbequed. It resembles a rounded bee-hive and can be embedded into the ground with a small opening at the base Tandoori is a drier form of cooking than the oven, since moisture escapes through the top of the Tandoor. It is fired by charcoal. Thaali: Individual serving plate. In an Indian restaurant you will be able to order a Vegetarian or Non-Vegetarian Thaali and you will get an entire meal from appetizers to dessert on a plate.